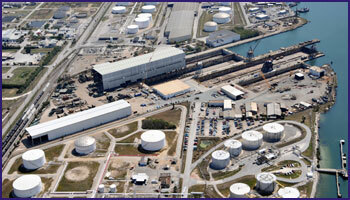 Tampa Ship is a full-service conversion, overhaul and repair organization with facilities in Tampa, Florida. Tampa Ship is conveniently located in the protected harbors of Tampa Bay directly accessible from the Gulf of Mexico via a 43 ft. (13.11m) channel, and is the largest, most complete shipyard between Pascagoula, Mississippi, and Hampton Roads, Virginia. Tampa Ship fronts Sparkman Channel. Sparkman Channel is 43 ft. (13.11 m) in depth and 500 ft. (152.4 m) wide with a 700-ft. (213.36 m) turning basin and is maintained by the U.S. Army Corps of Engineers. One of the very few limitations to ship size we can handle is due to the Skyway Bridge at the mouth of Tampa Bay. This bridge limits the max height out of water (H.O.W) to 175 ft. (54.559 m). The shipyard covers 62 acres (25.09 ha) and features four graving drydocks with 28-ft. (8.53 m) draft capabilities for ships up to 746 ft. (227.38 m) in length, and 24-ft. (7.31 m) draft for ships up to 907 ft. (276.44 m) in length, and a covered erection building 600 ft. (182.88 m) long, 145 ft. (44.20 m) wide and 115 ft. (35.05 m) high capable of 880T lifts. Year-round warm weather, skilled craftsmen, and an extensive local network of experienced subcontractors combine to create the ideal environment for your next ship repair, conversion, or new construction project. A full range of utilities and services necessary for efficient production are provided. The facility is served by the CSX Railway System and is just minutes from Tampa International Airport, interstate highways 4, 75, and 275. Tampa Ship is the logical choice.